I'm gonna be honest. I wasn't that into Casablanca. It just felt so deserted and the cockroaches that roamed the streets at night were huge. And maybe it didn't help that I was operating on three to four hours of sleep while trying to adapt to heat and getting swindled by a cab driver. I wondered about the day-to-day of the cute hotel owner's son when he said he much preferred Casablanca (but I think his fave city is Marrakech). We were there during Ramadan. And I'll admit I didn't really know what that would entail. I didn't really do a lot of research in general because tour group. But maybe I should've at least looked up how much a cab typically costs... Pro tip: look up how much a cab typically costs before going to a new country. Anyways, we walked into a feast at Le Riad. I was starving, but not exactly buffet-starving. I think I've trained myself to be rarely buffet-starving because I can't balance hunger and food value in those situations. But we settled on the buffet after being handed a menu because the kindly old man insisted. This was just the beginning. With single bites taken out of everything. We were brought many plates of things to try, and I felt so bad not finishing every single thing. Favorites were this fried crepe thing and the sardine tagine and the puck shaped bread that I keep thinking is corn but is actually semolina. And the wooden soup spoon. The sticky cab situation started when I wanted to get some sweets at Patisserie Bennis in Habbous after walking through Hassan II Moque by the water. It got suspiciously worse when the cab driver insisted on taking us around the market area. I hate to be so cynical, but no one does that out of the kindness of their hearts. Not in a situation where I'm the tourist. I was momentarily distracted by the bins of sweets and then the piles of olives and then the bags of spices, my first sighting of the Morocco I had romantically pictured in my head. And it is as satisfying as I imagined - like when I first color-coordinated my closet. Something I learned about myself is that I will give in when pressed. Oh wait... I knew that already. When faced with two insistent people, I can only stand my ground on the opposite curb for so long. And so back to the hotel we went. Where I was unexpectedly contented to sit in the romantic open air courtyard while eating our hard earned (... or hard paid-for) sweets with mint tea. So if there's anything to know about me, it's that I can be easily appeased with food. 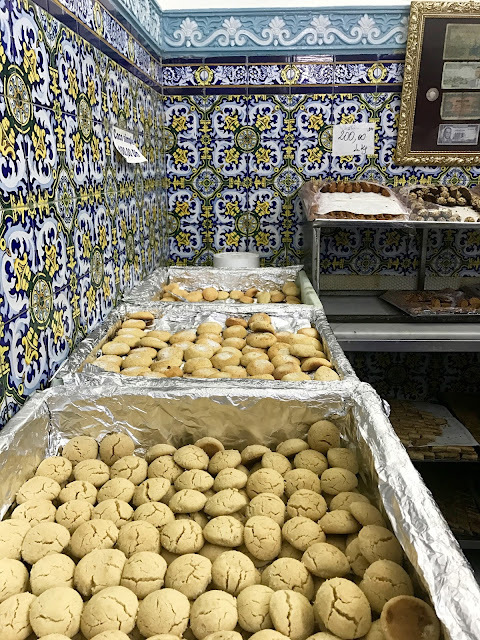 We had asked for the most popular ones, and it was hard to pick a favorite, as they were all variations of almond pastes rolled or wrapped in something. One preference I do have though - no sugar in my mint tea please. Also romantic? The dim hookah lounge tucked in a corner of Hotel Transatlantique. I remember spending hours at hookah lounges in high school, blowing smoke bubbles and getting dizzy off fruity flavors. It had been years, but the light headed nausea still felt the same. I think Audrey and I were both hoping to run into the Aussies on the other tour group (met the cute hotel owner's son instead) before we sat down at a booth. Here they set up a whole hookah per person, and I can imagine how people would spend hours drowning in smoke and music. The only thing missing in this scene were belly dancers, but maybe they came after we went to bed.